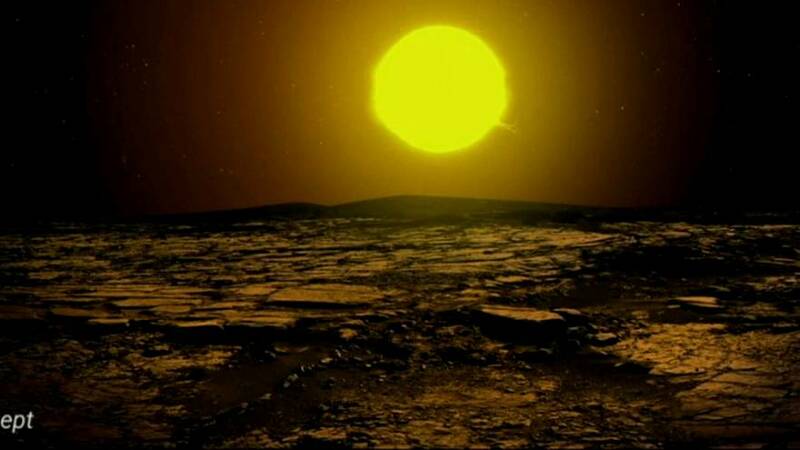 An artists impression of the newly-discovered Kepler 90i planet. A joint effort between Google and NASA has led to the discovery of a new planet in the first known star system with as many astronomical bodies as the our solar system. The newly discovered planet orbits the Kepler 90 star, 2,500 light years from Earth in the constellation of Draco. Known as Kepler 90i, the planet is the smallest of the eight now known to circle the star but is 30 percent larger than Earth, and has an estimated surface temperature of 420 degrees celcius. “This ties Kepler 90 with our own solar system for having the most known planets,” said Paul Hertz, director of astrophysics at Nasa’s headquarters in Washington DC. Using the planet-hunting Kepler telescope, launched in 2009, researchers discovered the new planet after they teamed up with artificial intelligence specialists at Google to analyse data collected by the space-based observatory. The Kepler telescope searches the heavens for alien worlds by looking for the shadows cast by planets as they orbit their parent stars. Thus far, the observatory has already discovered more than 4,000 candidate planets, of which about 2,300 have been confirmed. Astronomers now believe that there is at least one planet orbitting every star in the sky. However, for all of the telescopes successes, NASA scientists knew that some planets would slip past unnoticed. With the help of Google's AI division, the team were able to train a neural network to learn what a signal from a distant planet looked like and comb through the telescopes observations of 670 stars for planets that had slipped through the net.